You need retirement income, but how much money should you take out each year? You want to make sure you don’t spend down your accounts too fast. The answer is determined by calculating a safe withdrawal rate. A safe withdrawal rate is the estimated portion of money that you can withdraw from your investments each year while leaving enough principle that the funds last for your entire life—even if you retire during a time when the economy and/or the stock market is not doing well. For example, if you spend $4,000 for every $100,000 you have invested, you would have an initial withdrawal rate of 4 percent. Traditional calculations say this withdrawal rate is about right; you can spend about 4 percent of your investments each year and most likely never run out of money. 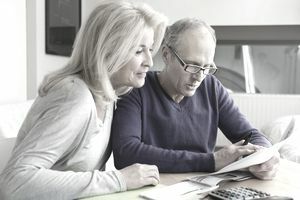 However, if you want to withdraw a little more, there are a set of six rules you can follow that will give you the greatest probability of increasing your retirement income. If you follow these rules, you may be able to have a withdrawal rate as high as 6 to 7 percent of your initial portfolio value, meaning you could withdraw $6,000–$7,000 per year, for every $100,000 you have invested. This is not a sure thing. If you are going to use these rules, you have to be flexible; if things don't go well, you may have to make some adjustments and take out less later. Your portfolio will deliver a higher withdrawal rate when the market has a low price to earnings ratio. A price to earnings ratio (P/E ratio) is a tool that can be used to estimate the future long-term returns (15+ year cycles) of the stock market. Consult the chart below for a visualization. Please note: it is not very useful in predicting short-term stock market returns. For a retiree, the market's P/E ratio can be used in determining the right starting withdrawal rate, an amount that can safely be withdrawn each year, with the ability for subsequent withdrawals to increase with inflation. When the P/E ratio of the stock market (S&P 500) is below 12, safe withdrawal rates range from 5.7 percent to 10.6 percent depending on the time period studied. When the stock market’s P/E ratio is in the range of 12 to 20, safe withdrawal rates range from 4.8 percent to 8.3 percent, depending on the time period studied. When the P/E ratio of the stock market is above 20, safe withdrawal rates range from 4.4 percent to 6.1 percent depending on the time period studied. The point to remember, if you retire when the stock market has a low P/E ratio, your portfolio will likely support more income over your lifetime than someone with the same amount who retires when the market has a high P/E ratio. Keep the right proportion of equities to fixed income so your retirement income can keep pace with inflation. Specifically, your portfolio must have a minimum equity exposure of 50 percent and a maximum equity exposure of 80 percent. If you fall too far out of this range, you run the risk of running out of money. Too much in equities, and volatile markets may scare you away at the worst time. Too much in fixed income, and your retirement income will not keep pace with inflation. Use a multi-asset class portfolio to maximize your withdrawal rate. Think of building a multi-asset class portfolio like creating a well-balanced meal. Imagine, for example, sitting down to a sumptuous dinner of steak, shrimp, and baby back ribs. Although the meal has variety, it is not well-balanced. In the investment world, instead of food groups, you have asset classes. A well-balanced portfolio contains, at a minimum, an allocation toward each of the following asset classes: U.S. equities of both the large cap and small cap type (stocks or stock index funds), international equities, and fixed income (cash, certificates of deposits, and bonds). Each year you would rebalance this portfolio back to a target mix. If you use funds and/or financial advisors that have higher expenses than index funds, then you may need to take a lower withdrawal rate to account for the higher fees you are paying. Take retirement income withdrawals in a particular, prescribed order. When you take withdrawals, your retirement income must come from each category in a particular order. For the new investor, these rules can be complex. To simplify the idea, picture three buckets. Bucket number one is filled with cash, enough to cover one year’s worth of living expenses. Inside bucket number two you stack your fixed-income investments (sometimes called a bond ladder). Each layer represents one year’s worth of living expenses. Every year, one year’s worth of spending money “matures” and moves from the “fixed income” basket to the “cash” basket. This assures you always have enough cash on hand to cover your upcoming expenses. The third bucket is filled to the rim with equities. You may only take money from the equity bucket when it overflows. An overflow year is any year when equities have above average returns, roughly an annual return in excess of 12 to 15 percent. At the end of an overflow year, you sell excess equities and use the proceeds to refill the fixed income and cash buckets. There will be many years where the equity bucket does not overflow. It will take discipline to realize it is okay to let the fixed income and cash buckets get to a low level during these years. Eventually, an overflow year will come along and all buckets will be refilled. Following this rule will prevent you from becoming a victim of your own emotions and selling investments at an unfavorable time. Many of these rules were developed through research conducted by Jonathon Guyton. You can find additional details on his prescribed order of which assets to use first, in the article titled Decision Rules and Maximum Initial Withdrawal Rates on his website. This article was first published in the March 2006 issue of the "Journal of Financial Planning." Take retirement income pay cuts during bear markets. This rule functions as a safety net to protect your future retirement income from erosion during bear markets. It is triggered when your current withdrawal rate is 20 percent greater than your initial withdrawal rate. Sounds confusing? The best way to explain this rule is to use an example. Assume you have a $100,000 and you start withdrawing 7 percent or $7,000 each year. The market goes down for several years and your portfolio value is now at $82,000. The same $7,000 withdrawal is now 8.5 percent of your current portfolio value. Since your withdrawals now represent a bigger piece of your portfolio, this "pay cut" rule kicks in, and says you must reduce your current year’s withdrawal by 10 percent. In this example, your withdrawal would go from $7,000 to $6,300 for the year. Much like real life, where some years you receive a bonus and other years a pay cut is required, this rule adds the flexibility you need to endure changing economic conditions. When times are good, you’re eligible for a raise. This final rule is most people’s favorite. The opposite of the pay cut rule, it is called the prosperity rule. It says that as long as the portfolio had a positive return in the prior year, you may give yourself a raise. Your raise is calculated by increasing your monthly withdrawal in proportion to the increase in the consumer price index (CPI). If you were withdrawing $7,000 per year, the market had a positive return, and the CPI went up by 3 percent, then the following year you would withdraw $7,210. Following these rules takes discipline. The reward is a higher level of retirement income, and an increased ability to maintain purchasing power. It is important to make informed decisions about your money. If all this investment “mumbo jumbo” gets overwhelming, then take a step back and think of it as a new career. It takes time to learn new skills. Remember, the right decisions will help you generate retirement income that will last. Prior to implementing a retirement income plan of your own, take the time to learn as much as you can. Try one of these online investment classes to learn more. If you seek professional advice from a qualified fee-only financial advisor make sure you find someone familiar with the latest research in this area.